We have a new Peace Corps Volunteer who will be communicating with our class from Belize. His name is Len Zeoli. He is a graduate student at Washington State University in Environmental Science. He will be working in Belize for the next two years. 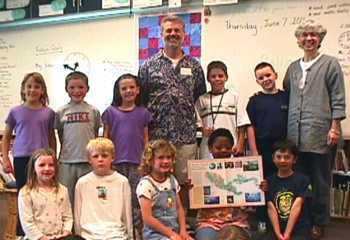 He visited our class before he left our city of Pullman Washington. He tols us about Belize. We are looking forward to receving messages from him next school year about the people of Belize and about the ocean and rain forest habitats of that country. Watch for his messages here!